It’s incredibly exciting to be able to announce that we have a new integration available: Front! If you ever wished Front had an embeddable form/widget for your website/app, this is the integration for you! Our integration with Front has been in the making for around 3 years. Yes, that’s not a typo, 3 years. The conversation with Mathilde Collin started in the summer of 2015 to explore a Doorbell-Front integration. After an initial attempt at building the integration at the time, we unfortuntely couldn’t make the integration work well enough to ship it. Since then though Front have worked hard on releasing a new and improved v2 of their API, which solved the initial issues we had. Setting up the Front integration is very simple! Head over to the setup page, and click the “Connect to Front” button. 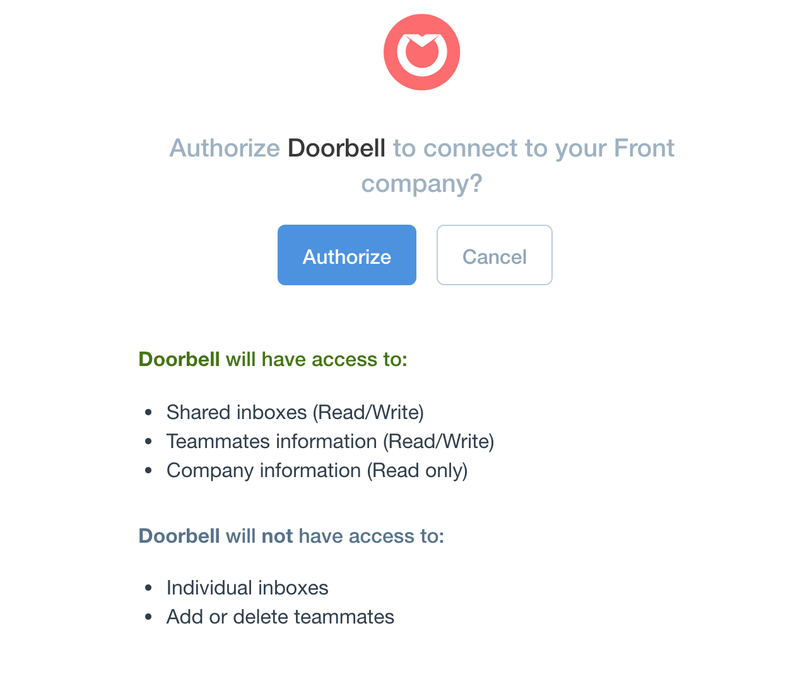 This will start the authentication process to link Doorbell to your Front account, so we can add your customers’ feedback to Front. Once that’s done, we’ll automatically send the feedback to your selected Front inbox! You can read a more about the integration on Doorbell’s integration page on Front. So go ahead, give it a try! If you haven’t got an account yet, go sign up now: https://doorbell.io!